Overview The preserve is located at the Canadian border in central Alaska. You can float the big deep Yukon River in brand new specialized boats or bring your any kind of boat you want. 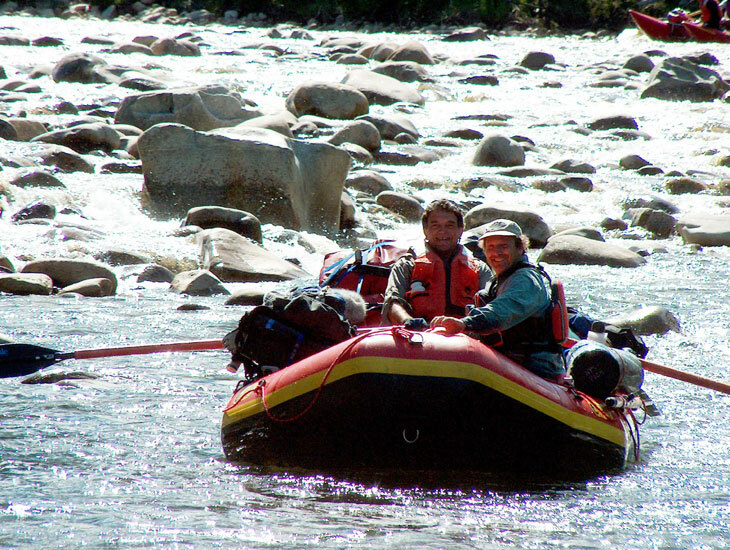 I recommend the top of the line whitewater of the Charley River be done in a very sturdy and suitable inflatable like a high quality zodiac or similar. 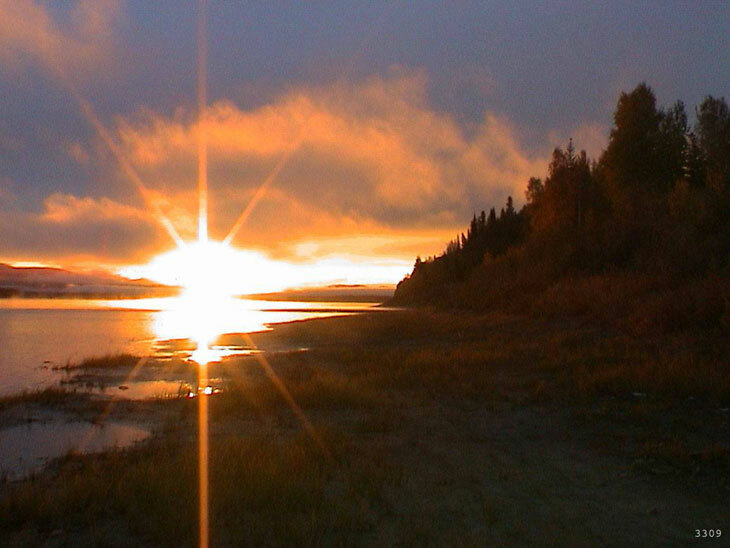 Picture at sunrise near Slaven's Roadhouse on the Yukon River. The Yukon River freezes to an average depth of 4 feet here in the deep interior part of Alaska. It is frozen from mid-November to the end of May. You obviously won't be here then. Backcountry camping is permitted on any federally owned land within the preserve and there is plenty of it to go around. Use the sand bars for your campsites because the wind blowing more here keeps the bugs to a minimum. It is also better to have long distance view of the area you are staying put in so you can watch out for bears and see them ahead of time. Bring what you need from home as here are no stores or supply houses out here. Do not trench for tents or cut branches for bedding support or the rangers will be all over you. When you set up your campsite remember you are very likely to come into contact with bears. Set up your cooking spot 100 yards away from where you will sleep. Keep all food, trash and petroleum items in the cooking area never where you are sleeping or resting. Keep all food, beverages, food containers, cooking stuff, and aromatic lotions or soap in a bear resistant container. There are some trees here unlike some of Alaska other parks so you can sometimes hang your supply at least 10 feet off the ground & 5 feet away from the truck of the tree. Of course when you leave try to return the campsite to a natural appearance and make it look as if you were never there. The National Park Service maintains a number of public use cabins located on the Yukon River. If you check with the rangers at the visitor center in Eagle they can set you up and advise as to expected weather conditions. There are some private lands within the boundaries of the preserve. Most of the campgrounds and run by the Bureau of Land Management are by the Taylor Steese Highways. Eagle and Circle have small campgrounds within the city limits and in nearby areas that you may find more comfortable than being all the way out in the middle of nowhere alone. Picture of Slaven's Roadhouse, built in the 1930's. It remains our best example of the historic roadhouses that served as rest stops for travelers and mailcarriers on the Yukon River route. The musher or sled captain is leaving Slaven's Roadhouse in the Yukon Quest International Sled Dog Race. The Yukon River starts out near the coastal mountains of Canada and flows nearly 2,000 curvy miles finally emptying into the Bering Sea. 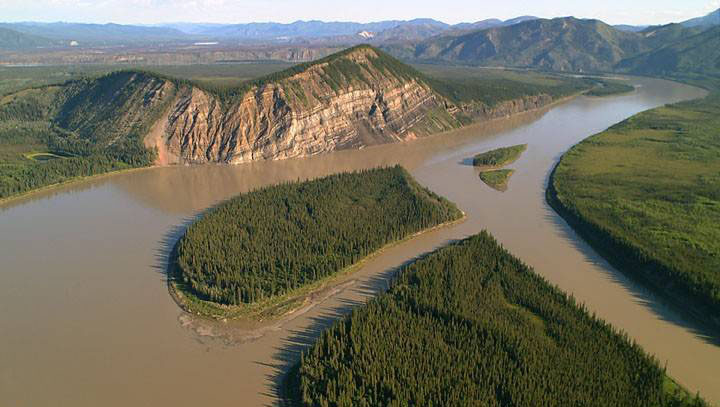 It flows northwest through Yukon-Charley Rivers National Preserve for 120+miles of it's length. The river is silt laden in summer due to glacial runoff, and it is completely clear in winter when glaciers are frozen. The silt makes purifying water more difficult so be prepared and do your water purification homework if coming here. When the river starts flowing through the preserve near Eagle, it goes across a narrow floodplain with high bluffs and heavily treed hills surrounding. Visitors get to Eagle usually by driving down the Taylor Highway or flying in on a rental or charter plane. Then they typically drive out on the Steese Highway or fly to Fairbanks for more fun. Motorized and non-motorized boats of all sizes and types are the principal means of travel on this section of the Yukon River. Pretty much anything is legal but you want to pick the right boat for your activity. Canoes, kayaks, homemade wooden rafts, and inflatable rafts are all used here as well as jet boats. You can bring your own boat or rent canoes or rafts locally. Jet skis and other personal watercraft are prohibited in the preserve. 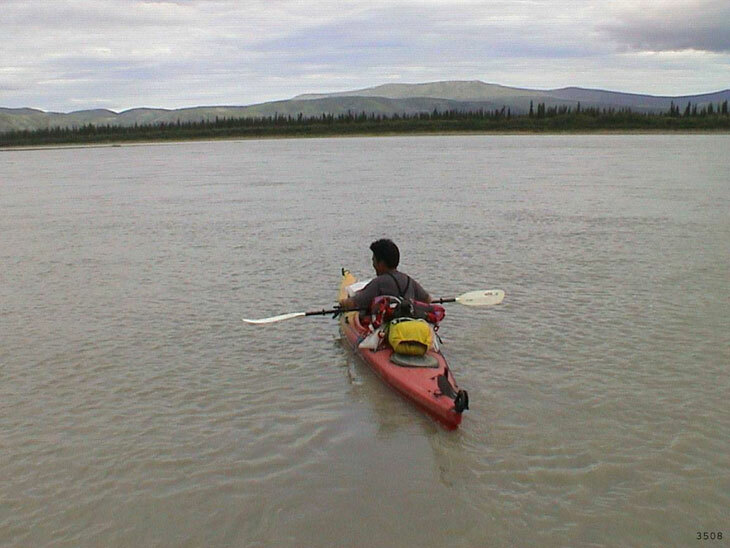 Picture of a kayaker floating the Yukon River. The journey from Eagle to Circle is 158 miles long with most visitors starting in late May and going through until September. The Yukon River flows about 6 miles an hour so the current is not horrendous. The worse the weather the longer it takes and sometimes people float the entire day during daylight hours. You can of course stop along the way and eat, shoot pictures or take small hikes. If you float 25-30 miles per day and camp each night it will take you about 5 days to end at Circle. Take plenty of extras though in case trip time is longer due to bad weather or an accident. For the safety of visitors, it is recommended to file a Voluntary Float Plan with the preserve and a friend. To file a float plan, contact the Eagle visitor center (907) 547-2233. What To Bring to Eagle, well there is not much at the visitor center, most things were damaged or lost by the breakup in May 2009. There was no hotel in 2010 and the Bed & Breakfast was being repaired. The cafe and the public shower are gone so bring the hot water device I show in the Vanabode book. There is a small grocery store and they have gas and propane though it is very expensive. Circle has very little as well. Bring everything with you including all specialized camping gear and supplies. You will be on your own here so practice self sufficiency before leaving home for the wilds of Alaska. Help is always a long way off too so be careful and keep the accidents nonexistent if possible. Weather conditions change rapidly and are usually severe even in June and July. If you are in the water you should wear a high quality personal life preserver and keep emergency gear with you: water, waterproof matches, signal mirror, knife, first aid kit, whistle, magnesium fire starter, and tightly sealed emergency rations. Other items to bring may include waterproof topographic maps, compass, a GPS, and water proof two-way radio with good batteries. Floating The Charley River can be super fun but you must be careful. 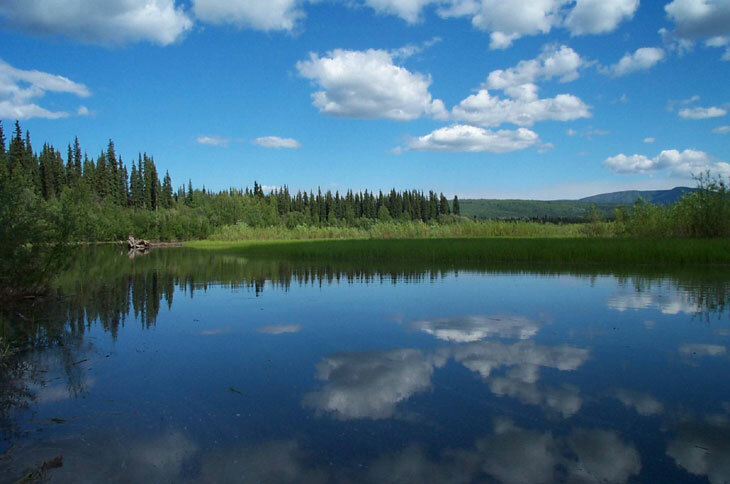 It starts in the Yukon-Tanana upland and flows north 100+ miles to the Yukon River. The river is cool because it goes through 3 very distinct topographic areas: open valley, entrenched river, and open floodplains> This makes it nice because on one float you get to see so many kinds of spectacular scenery and real unspoiled wilderness. Rugged wild mountains filled with wildlife drain down in to this upland valley. Charley passes under high bluffs and cliffs where the white water rapids get rough. As the river flows down it hits the flat plains of the Yukon Valley drifts down to become the Yukon River. Picture of rafters successfully skirting car size boulders on Charley River. The river passes beneath high bluffs and cliffs where the majority of the rapids occur. When the river leaves the high bluff area, it enters the flat plain of the Yukon Valley where it slowly meanders to the Yukon River. Rapidly changing weather and rising water levels can create some nasty trouble. Exercise extreme caution when floating these preserve rivers and pay attention. Water temperatures are cold even in the summer, meaning hypothermia is easily possible year round. Life jackets are mandatory while on the water. I say wear the silly looking helmet too. Rivers are dynamic ever changing places and no two trips down will ever be the same. No permits are required for floating the Charley River, but you should file a float plan and notification of trip completion by calling the Eagle field office at 907- 547-2233. Access? There is no direct road access into the Charley River basin you have to get here by boat mostly but some come by plane. This is what keeps this place so unforgettably pristine and private. A lot of folks use Gelvins airstrip above Copper Creek. If you start boating at Three Fingers or Joseph you will probably have to portage or drag your boat for some distance. This means increased risk of tearing the skin and wreaking havoc on your "time schedule". Picture above of Kandik River. Kandik is a Han Athabascan word meaning Willow Creek. Most people coming to Charley River charter a plane from Fairbanks, Circle, or Tok to the headwaters of the Charley, float down to the Yukon, and get out at Circle. Average float time from the headwaters of the Charley at Gelvins airstrip to the Yukon River (approximately 75 miles) is normally at least 7 days. If you want to go all the way to from the Yukon River to Circle you will only need about 2 additional days since there are no rapids on this section of the Yukon. You will probably see falcons, the incredibly industrious caribou, wild free range sheep, massive moose, and serious big bears on the narrower sections of the river. Be careful, go slow, and take pictures but do NOT get too close or linger with bears or animals with small young nearby. Store all food, drinks, dishes, food containers, and cooking devices in a bear resistant container and cached at least 100 feet from where you are sleeping. Put it 10 feet above the ground and no closer than 5 feet from the tree truck. You can hunt and fish here with the proper permits. Hiking is tough here but so very rewarding. There are no maintained trails in the preserve; none. If you follow the animals tracks you can often come across old mining trails that are a little cleared out. Most like the summer hiking best at about 3000 - 4000 feet. There are less biting insects, less bushes and improved visibility for the same reasons. The big fires of 1999 and 2002 fire severely some trails use as easy and enjoyable hiking areas. Picture of Calico Bluff formation showing its layered limestone and shale. The Yukon River wanders through the preserve for about 130 twisted miles and drops some 200 feet along the way. The River and its tributaries cut through roughhewn cliffs, making it easy to see good geological records of the floral and fauna history of this part of America. Vanabode Special Notes: Alaska is extraordinary and it will probably remain so far past my day of death, But I can't say it's a good fit for Vanaboding. It is rugged and wild and the inclement weather can be devastating. If you do travel go in June or July and do your homework so that your van is outfitted for Alaska's extreme temperature swings, rain and bugs here in the Yukon Charley Rivers National Preserve Alaska.